Clean your panes with an innovative cleaning approach that has met the requirements of over 94% of our customers in Queensbridge! Q: How is your window cleaning Queensbridge going to bring back the clarity of my windows? In-house window cleaning – The technicians will remove grime with ladders and sponges. A: If you spot dim clouds on the day of your booking, don't panic. The window cleaners in Queensbridge can still carry out the service provided they're facing a light shower. However, in the event of a downpour, we will kindly ask you to put off your appointment to avoid any injuries. Q: Can I help the experts in any way? A: Yes, you can! The cleaning team will need a empty parking space in close proximity to your property (30 metres or less) and on the same side of your casements. A: It's no problem for the cleaners to wash the outer surfaces of your windows as long as they are free to pass your front gates. And if smudges have landed on your internal surfaces as well, just inform us and we'll perform a free key pick-up and delivery. A: We will instantly inform you about the reason of the expert's delay and notify you once he parks near your premises. 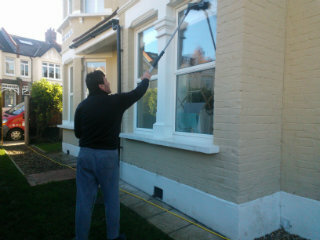 A: Yes we're licensed to clean any type of window or window component. What's more, every PVC or UPVC frame or ledge will be treated at no extra cost! After reading through lots of customer feedback, we've changed our window cleaning Queensbridge's fees. Now, you can book our service at prices that are nothing short of affordable! For further information, please consult with our price table below. No matter where your stains have taken shelter, our efficient window cleaning in Queensbridge will eliminate them with ease. We have encompassed a number of washing methods. Our outside window clean is designed for buildings that do not exceed four floors. To let the sunshine back inside, the window cleaners in Queensbridge will come in a caravan, outfitted with a retractable water-fed pole. This gear is attached to a water tank, filled with purified water. After being pushed as a powerful flow from the pole's brush-head attachment, the water will erase all smears in an attempt to regain its natural structure. To get to muddy window corners of high-rise properties, we'll send a proven team for rope access window cleaning. These approved abseilers will utilize frequently inspected ropes and harnesses or position ladders and cherry pickers to renew the appeal of your panes. We've got all essential COSHH reports in place and follow each safety instruction. To make the in-house side of your glass façade just as lustrous, the experts will rely on the ordinary ladder and sponge washing procedure. In our aim to help as many Londoners as humanly possible, we've broadened our window cleaning in Queensbridge to encompass extra locations across London. For your convenience, we've mentioned the names of these close by locations below. Another quick and easy way to get a free instant quote or to book window cleaning services Queensbridge E8 is through our web site.